We invite you to explore India - the Land with infinite beauty ! Whether you soar high into Himalayas or peer under the ruins of the Ancient monuments dotting the landscape of India, you will cherish the experience long after your visit ! 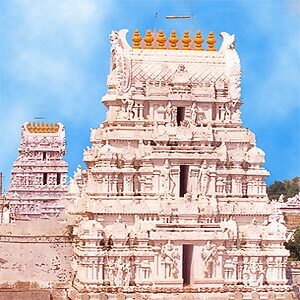 This India Travel Guide on Srikalahasti Temple is free from any commercial interest! This site is dedicated to promote India - the vast subcontinent, its glorious past, magnificent landscape and its infinite variety. Also known as ‘Kailas of the South’, Sri Kalahasti is more than two thousand years old, the spiritual equivalent of the mighty Himalayas. It sits on the banks of a small river ‘Swarnamukhi’, known as ‘Ganges of the South’. This temple is located 36 km away from Tirupati in Chittoor district of Andhra Pradesh. Historical records suggest that the inner temple was constructed around 5th Century and the outer temple around 12th Century. Srikalahasti is derived from sri (spider), kala (serpent) and hasti (elephant). It was here that the elephant worshipped Lord Shiva with great devotion. A spider which lived in the inner sanctum of the temple also worshipped Lord Shiva by weaving elaborate images of the Lord. One day when wind came up, fire was caused in the sanctum sanctorum so as to destroy the spider’s offerings. The spider became angry and was about to gulp down the flame, even endangering its life. Lord Shiva, appreciating the devotion of the spider, appeared and granted the spider a boon. The spider requested for moksha, and release from the cycle of births and deaths. There is another legend which claims that the spider became one with Lord Shiva, the Supreme Self. A cobra worshipped the Hindu God Lord Shiva and it offered rare gems, pearls and rubies brought from a mythical place where ‘Nagas’ dwell. In India, serpents are regarded as the most visible symbols of spiritual power of the self. An elephant, fresh from its purifying bath in the nearby river, also came to worship the Lord. This elephant decorated the altar with leaves from a holy tree. In the process, the elephant scattered the gems placed by the snakes. The cobra angered to see its offerings scattered, replaced the leaves placed by the elephant with gems. This act went on for several days until one day the cobra decided to punish whoever is destroying its offerings. When the elephant returned to worship, the cobra injected its venom in its trunk. The elephant dashed its head on the stone altar in an attempt to kill the snake. The snake fell out of the trunk and died from its wounds. The elephant also succumbed to the poison. Lord Shiva resurrected both of them and liberating them took them into his own self. At the foot of the Linga, one can see spider, elephant tusks and a five headed cobra reminding the devotees of their supreme devotion to the Lord. This temple depicts four universal motivations. They are represented by four deities facing the four directions. Lord Shiva is seen in the form of Lord Dakshinamoorthy, representing desire of liberation. Goddess Gnanaprassonamba, the Mother of all Knowledge represents wealth of the freedom of limitation conferred by self knowledge. Lord Kalahastishwara, the Lord of Kalahasti, facing west, symbolizes liberation, which is the death of the ego and rediscovery of the Self. Human form is the most revered and the universal symbol of the self. Man is cast in the image of God. The Upanishads talk of the divine nature of man. The ineffable formless God/Self perceived by mystics is this whole world and everything in it. The temple is claimed to be built by 12th Century Chola King Rajarajendra. Vayu incarnated as Lord Shiva is worshipped as Kalahasteeswara. The temple’s main idol is the vayu (air) linga. This can be witnessed by the constantly flickering lamps at the sanctum despite the lack of air movement inside. The vayu linga can be seen moving despite the doors being closed. The lingam is white and is considered ‘swayambhu’ or self manifested. The temple architectures of Chola, Pallava and Pandya and Krishnadevaraya styles can be seen here. Ramanathan Chettiar from Tamil Nadu and performed the kumbhabhishekam in 1912. This temple has great architectural value. A tourist could well spend some time exploring the physical and spiritual beauty of this temple. The insides pillars look fresh as they were several hundreds of years back. The temple has three lofty gopurams which are remarkable for their architecture. There is a hundred pillared mantapam in this shrine. The old idol of Sri Gananprasunambika Devi is placed on the outside on the temple gates and lots of devotees pray to her. Pathala Ganapathi is associated with old Sivalingam beneath the temple.